Little was known about the interior of North America west of the Mississippi River in the late 18th century. European and American explorers, military missions, and fur traders had penetrated into parts of the Missouri River basin, and many of the native Indian tribes had been contacted. 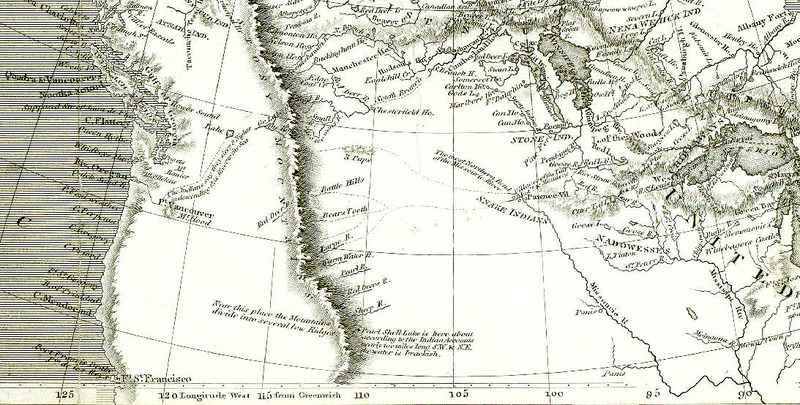 Seafaring explorations had charted much of the Pacific coast. Geographic knowledge was nonetheless quite sketchy or completely speculative for the continental interior. Lewis and Jefferson had access to various maps to help their planning for the expedition of discovery. These maps were the results of several previous explorations by French and British agents during the 18th century. From the maps presented below, it is apparent that continental geography was relatively well known for the lower Missouri region from the Mississippi to the Mandan and Hidasta Indian villages in modern North Dakota. For the Corps of Discovery, there was, in fact, little to "discover" along the lower Missouri in terms of basic geography. The greater emphasis was placed on establishing favorable diplomatic relations with Indian nations along the way (Ronda 1984). The lower Missouri passage was also a time of testing the men, their equipment, and techniques in preparation for more arduous travels in subsequent years. 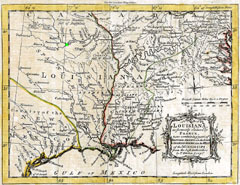 Map of "Louisiana as formerly claimed by France, now containing part of British America to the east & Spanish America to the west of the Mississippi." This map was issued as a result of the French and Indian War, and it depicts the state of geographical knowledge of the Mississippi basin as known in the middle 18th century prior to the American Revolution. Published in the London Magazine, June, 1765. 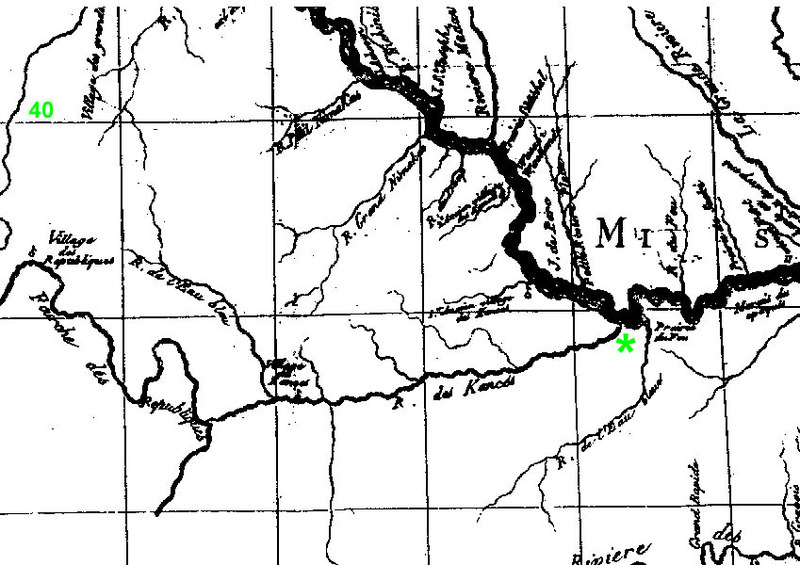 Green dot shows the junction of the Missouri and Kansas Rivers; the latter is labelled as the "Padoucas River," and "Kansez" Indian villages are indicated. Original map in the private collection of J.S. Aber. Click on the small map to see a large (505 kb) version in full detail. Portion of Carte du Missouri by F.P. du Lac (1802) showing the lower Missouri region. This French map predates the Louis and Clark journey by just a few years. It depicts a broad river channel with numerous sand bars and islands, as described in the journal of Lewis. Green star indicates Kawsmouth, the future site of Kansas City. The 40°N latitude is the boundary between Kansas and Nebraska. Click on small image for a full-sized version (122 kb). Portion of the map British Possessions in North America. This map depicts geography, as known before the return of Lewis and Clark. The Missouri River is well shown to the Mandan Villages in modern North Dakota, and the Pacific coast is depicted in considerable detail. However the upper Missouri and Rocky (Stony) Mountain regions are mostly "empty" terrains. A copper-engraved map published by Rees, Philadelpia (1806). Original map in the private collection of J.S. Aber. Click on the small map to see a large (284 kb) version in full detail. These maps are representative of the geographic and ethnographic information available to Jefferson and Lewis during their initial planning for the journey. Several ideas are noteworthy. For example the "Stony Mountains" are shown as a single range, which divides "into several low Ridges." Jefferson and Lewis conceived the western mountains as similar to the Appalachian Mountains, with which they were more familiar (Ambrose 1996). They thought that crossing the mountains would be an easy task--a portage of only a few days between headwaters of the Missouri and Columbia Rivers. Once across the mountains, they also considered the trip downstream to the Pacific would be quick. According to this map, "The Indians say they sleep 8 Nights in descending the River to the Sea." The Rocky Mountains and Columbia River gorge turned out to be far more formidible obstacles than Lewis and Clark ever imagined prior to their journey. 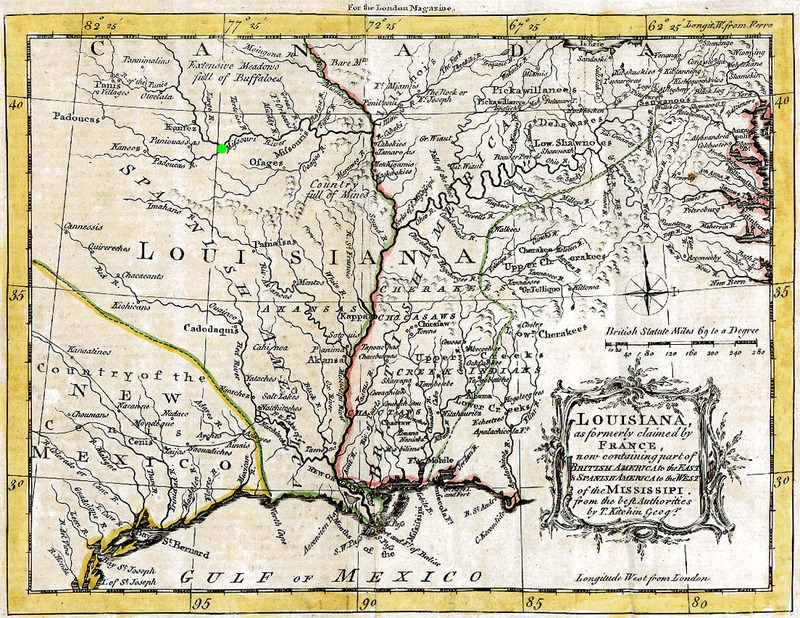 The acquisition of Louisiana (1803) was undoubtedly the most important addition of territory in the history of the United States. It transformed the U.S. from a relatively small country within a large continent into a country with manifest destiny to expand across the continent (Ambrose 1996). Jefferson set in motion the American empire with his decision. The future greatness of the United States rested upon Louisiana. Following the Louisiana Purchase, the Missouri River basin passed into the United States. However, land west of the Missouri to the Pacific was coveted by various imperial powers. 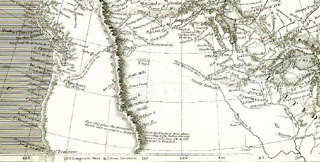 Spain, England, and Russia all had claims to the Pacific coastal region north of California. President Jefferson was anxious that Lewis and Clark should not only explore the Louisiana Purchase but also stake an American claim to the land extending to the Pacific. Eastern portion--Mississippi and lower Missouri region. The route followed the Mississippi and Missouri rivers through modern states of Illinois, Missouri, Kansas, Nebraska, and Iowa. 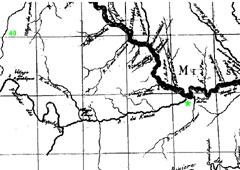 Green dot shows the junction of the Missouri and Kansas (Kanzas) Rivers. Click on the image at left to see a full-sized version. Reproduction of Clark's original map; Oregon Historical Society Press © (1998). Central portion--upper Missouri region. The route continued up the Missouri River through modern states of South Dakota, North Dakota, and Montana. In Montana, the return journey included explorations along the Yellowstone and Marias rivers. Click on the image at left to see a full-sized version. Reproduction of Clark's original map; Oregon Historical Society Press © (1998). Western portion--Columbia region and the Pacific coast. The expedition crossed the Rocky Mountains in what is now westernmost Montana and Idaho, then descended the Clearwater (Kooskooske), Snake (Lewis), and Columbia rivers to the Pacific Ocean. Along the latter two rivers, the journey passed through modern states of Washington and Oregon. Click on the image at left to see a full-sized version. Reproduction of Clark's original map; Oregon Historical Society Press © (1998). Lewis and Clark may have found the most practicable and navigable passage across the Continent of North America. What they reported, however, crushed Jefferson's hopes for an easy "northwest passage" that would open the way for trade across the continent and ocean to China (Ambrose 1996). The portages around the Great Falls of the Missouri and the Dalles of the Columbia were insurmountable barriers to river navigation of the day. The Rocky Mountain crossing was even more forbidding. The difficult northern river passage across the continent did not attract many followers, as the route was impassable for wagon traffic (Peters 1996). Subsequent western emigration moved along the Oregon, California, Santa Fe and other land trails to the south. Various branches of the Santa Fe Trail and Oregon-California Trail began in Kansas City or Independence, Missouri and Fort Leavenworth, Kansas. The short-lived Pony Express started in St. Joseph, Missouri. Lewis and Clark did, nonetheless, record many "firsts" in their epic journey (Peters 1996). First party of whites to cross the continental United States. First native woman, Sacagawea, known the cross from the Missouri to the Pacific. First black man, Clark's slave York, to cross the continental United States. First attempt to document ethnography for western Indian tribes. First comprehensive description and collection of flora and fauna of the western United States. First detailed map of the western United States from the Mississippi to the Pacific. 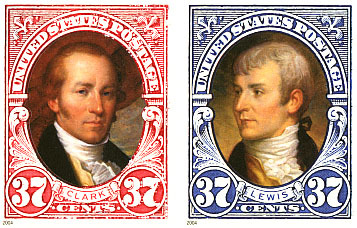 Lewis and Clark's accomplishments set the stage for rapid westward expansion that took place in the United States during the following decades. They laid the ground work for a thriving fur trade, led by such men as Manuel Lisa, William H. Ashley, Kit Carson, Jim Bridger, Pierre Chouteau, Jr. and John Jacob Astor (for whom Astoria, Oregon is named). Lewis and Clark's journey strengthened the United States' claim to the Pacific northwest region and brought forth the powerful concept of Manifest Destiny, which drove America for more than a century.